I lost my independence a year ago. I sort of realized it at the time, but I didn’t know how deeply it would affect me until yesterday. Last year, my son started his senior year of high school. As a senior, they were allowed to purchase a parking space close to the school and paint it any way they wanted to (as long as it conformed to school rules). When I was in high school, they didn’t have anything like this, and I didn’t get to drive to school. I wanted to make sure that my son could. The deal we made was that I would get to drive the car once or twice a week. “Of course we’ll share the car, Mom,” he told me. Silly me, I believed him! Over the past year, I’ve rarely driven it. I had this car ten years before he started driving. I could come and go as I pleased, without having to ask someone if it was okay to use the car. Suddenly, I was dealing with a teenager who, once he got his hands on the car, wasn’t about to relinquish control. I did manage to drive it on the weekends; I did have to feed the family, after all, so trips to the store were an evil necessity. But the looks I got from my son when I asked for the keys were those of annoyance. And as the school year went by, it became more “his car” and less “my car”. Radio stations set to heavy metal and country (Lord help me! ), black car seat covers with skulls on them (although now he has moved on to camouflage), his senior tassel and fuzzy dice hanging from the rear view mirror. After graduation, he found a job and the talk turned to him finding a truck. “You can have the car back, Mom.” Oh sure, give it back after he’s dented the hood, blown out the speakers, and scrapped paint off the left rear bumper! But we couldn’t find anything for him. I realized the other day we were going about this wrong. “Why don’t we try to find something for me?” I suggested to my husband and son. “Go for it!” they said, although I was pretty sure they didn’t think I’d have much luck. 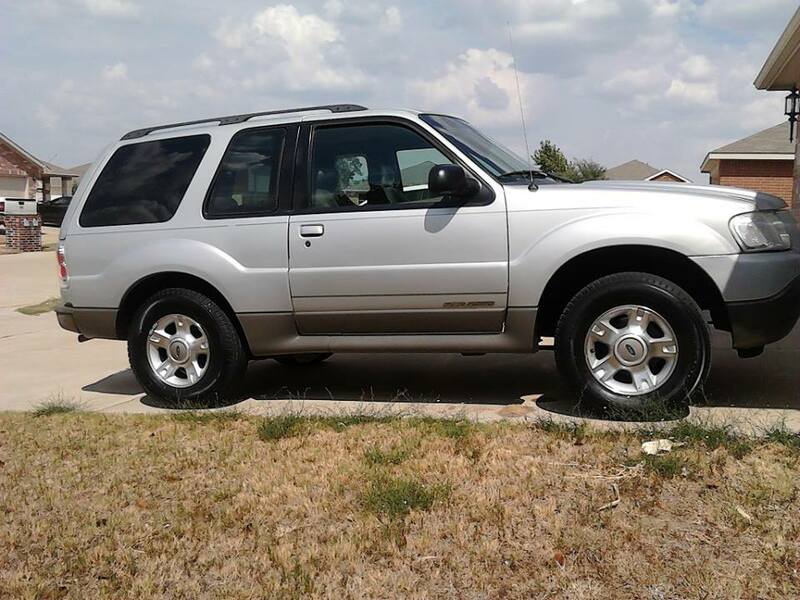 It took me only three days to find what I wanted: a 2001, 2 door silver grey Ford Explorer. I brought it home yesterday. As I sat here eating supper at 7:15, I thought “I need to take those bookmarks Larissa Reinhart (author of Hijack in Abstract) to the library.” I jumped in the Explorer and took off. I didn’t have to ask anyone for the keys so I could go. I just went. I even took the long way home, just enjoying the drive. It was at that moment that I realized what I had been missing for over a year. I didn’t feel depressed. This big weight that I had been carrying around, that I hadn’t completely understood was gone. Catch me if you can! Time to go for a ride! Hi fellow Teresa-fans! If you hang around her Facebook page, you probably know me by now. I’m Erin, Teresa’s right hand gal (or evil minion, depending on my mood). Normally, I write book reviews over on Paws & Print, but Teresa invited me to take over this space on Fridays. I’ll be bringing you reviews of the latest and greatest mysteries from my bookshelf. Have a favorite mystery series, or something new I should check out. Drop a comment on one of my posts. I love suggestions! Okay, now that I got that intro stuff out of the way, lets get down to the heart of the matter. This week, I am bringing you the newest release from Jenn McKinlay, Cloche and Dagger. Cloche and Dagger is the first book in McKinlay’s new mystery series, the Hat Shop Mysteries. This book was also my first foray into McKinlay’s work. Overall, I really enjoyed Cloche and Dagger. From page one, Scarlett had me laughing. She is quite the spit-fire and definitely an accident waiting to happen. In many ways, I could sympathize with her, the feeling lost and getting swept up into things beyond her control. Scarlett just intends to come to London to try to rebuild her life after her breakup goes viral on the internet. Next thing she knows, she is swept up in a murder mystery, trying to track down her missing cousin, dodging a killer that may or may not be targeting her and fighting growing feelings for Harrison. Yep, Scarlett quickly gets herself into a pickle. Perhaps my only complaint is that the book seems to drag in certain places. For having so much action in the storyline, those slower chapters confused me just a bit. 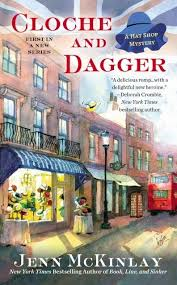 That is not to say that Cloche and Dagger is not worth adding to your reading list, it definitely is! Anyone who enjoys an old-fashioned murder mystery and a fun, quirky heroine should get a kick out of this book. Find out more about Jenn McKinlay and all her work on the author’s homepage. Until next my Teresa fans. Welcome to the wacky world inside my head! My Facebook page has grown by leaps and bounds in the last three days, so I thought it was time to give an update on my projects, plans for the blog, and introduce you to the people who make my books reality. We’ll start with the last thing first. There are several people who work behind the scenes to keep me in line. The wonderful lady who started me down this road is Jamie Livingston-Dierks. She encouraged me to publish the first Lizzie story, Death of a Cantankerous Old Coot, created the cover and formatted the story. Without her encouragement, I wouldn’t have made it this far. She writes the Gotcha Detective Agency mystery series under the name Jamie Lee Scott; they are excellent books. Check them out! There is a group of people who are responsible for me starting the series: the Dotters group. I wrote the story for them. After every chapter was posted on this blog, they threw out more suggestions on what should happen next. I used some of their ideas in that book, and subsequent books. They keep me going. Love you guys! I have two assistants: my son James, who listens to my ideas, contributes his own, and nags me to death. Erin Maurer-Lang is my technical assistant. She comes up with wonderful ideas for the blog, she has created some wonderful pictures for the street team page, and she is arranging some fantastic interviews and features for you! Between James and Erin, they are making sure that I’m getting new stories out for you! Death Silences a Gossip Queen – book six of the Lizzie Crenshaw series will find Lizzie and the gang investigating the death of an old friend as well as celebrating the wedding of Amelia Crenshaw, Lizzie’s mother. Deep, dark secrets of the victim will come to light, stirring up a whole pot of suspects. Did someone kill our Gossip Queen to keep their secret? Untitled book – I haven’t come up with a good title for this one yet. A simple request to help her friend, who is a private investigator, ends with two people shot, a dead body, corporate espionage, and a secretive husband. And that is just the first chapter! Top secret project – I cannot divulge much about this one. But I promise plenty of laughs and a very good mystery. Trust me! Plans for the blog: Erin and I have laid out a schedule for the blog: Mondays will be Teresa’s Diary Days – I will give you updates on projects and talk about whatever is on my mind. Fair warning, this could be a dangerous thing, especially if I am sleep deprived. I get very slap happy and goofy. Wednesdays will be special content days: interviews with authors or character interviews (similar to Lizzie’s interview with Patti Larsen’s Sydlynn). Fridays will be Book Review days with Erin. She reads almost as much as I do! I know she has been reading some wonderful mysteries, and I can’t wait for her to share the reviews! So that’s it! Lots of things going on here. It will take us a week or so to get them going, so please be patient. Until then, if you have any questions or anything that you are just dying to know, please feel free to ask! I love hearing from you! You have no idea how big the smile on my face gets when I receive a message or email from a reader!